The Chew Kee Store is a rare example of rammed-earth adobe construction. It was used by Dr. Yee and his son as an office, herb shop and residence. Dr. Yee was succeeded in ownership of the building by Chew Kee who operated the store from the 1880s until 1912. Kee sold cigar boxes, rice in large containers, patent medicine, opium and Chinese foodstuffs. The last resident was Chew Kee's adopted son, "Jimmie" Chow (Fong Chow Yow), a master carpenter, who lived in the store until he died in 1965. Chow retained what was already in the store, adding what he needed to work and live. Chow was the last Chinese person to live in Fiddletown. The contents of the store from all previous owners remain in place, and the building is now a museum. 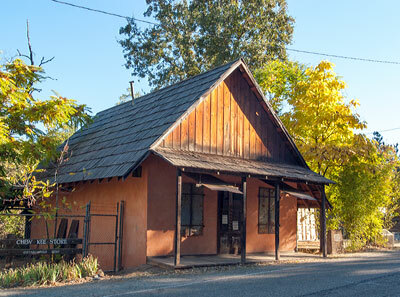 Excerpted from the NRHP nomination for the Fiddletown Historic District and the website Sierra Nevada Geotourism.